Shinobu Hashimoto, the screenwriter known for his collaborations with Akira Kurosawa (including Rashômon, Seven Samurai, Throne of Blood, and The Hidden Fortress) as well as his work with other directors, died on July 19 2018. He was 100 years old. Shinobu Hashimoto was born in in the Hyogo Prefecture of Japan on April 18 1918. He enlisted in the Japanese army in 1938, but contracted tuberculosis while still training. He spent the next four years recuperating in a veteran's sanitarium. It was while he was recuperating that another patient gave him a film magazine, spurring his interest in film. He corresponded with director Mansaku Itami, who became his mentor. Mr. Hashimoto was working for a munitions company when one of his screenplays, Rashômon (1950), found its way to director Akira Kurosawa. This began a series of collaborations that would span the next twenty years. In the Fifties Mr. Hashimoto wrote or co-wrote the screen plays for such films as Ikiru (1952), Seven Samurai (1954), Throne of Blood (1957), The Hidden Fortress (1958), The Chase (1958), Summer Clouds (1958), and The Bad Sleep Well (1960). He directed his first film, I Want to Be a Shellfish (1959), for which he also wrote the screenplay. In the Sixties Shinobu Hashimoto wrote or co-wrote such films as Zero Focus (1961), Seppuku (1962), Brand of Evil (1964), Revenge (1964), The Sword of Doom (1966), Samurai Rebellion (1967), Tenchu! (1969), and Dodes'ka-den (1970). 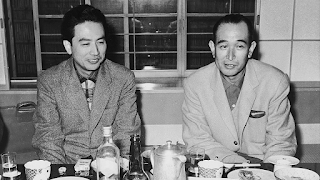 He also wrote and directed the film Minami no kaze to nami (1961). Shinobu Hashimoto continued writing screenplays into the Seventies and Eighties, including the screenplays for Yellow Dog (1973) and Tidal Wave (1973). He directed Lake of Illusions (1982)His last work was for a new version of I Want to Be a Shellfish released in 2008. Shinobu Hashimoto was one of the greatest screenwriters of all time. 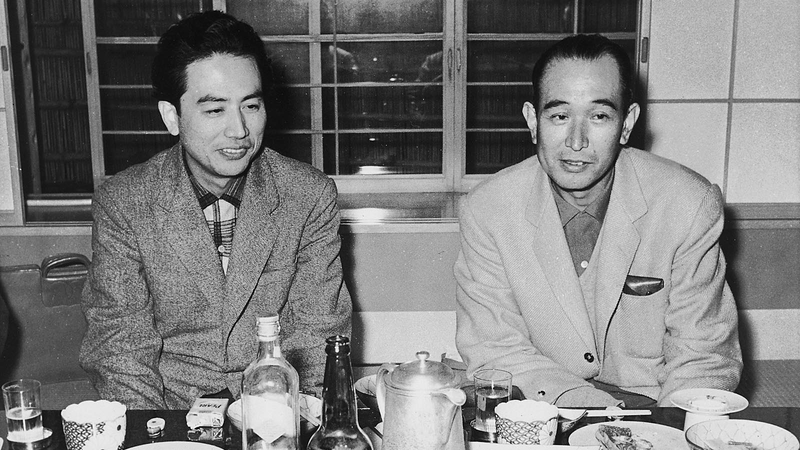 While best known for his work with Akira Kurosawa, he was very much in demand and worked with many other directors, including Ishirō Honda, Masaki Kobayashi, and Mikio Naruse. His work, whether it was jidai-geki, Japanese noir, or straightforward drama, was always characterised by strong, fully realised characters. If Rashômon, Seven Samurai, Summer Clouds, and Seppuku are regarded as classics today, it is largely because of Mr. Hahsimoto's contributions to them. To this day his influence is still being felt on international cinema. I can say without reservation that 2008 was one of the worst years of my life. The company for which I worked at the time transferred me to what was widely considered the worst division in the corporation. As a result I experienced increased stress, anxiety attacks, and even depression. Quite simply, I was suffering from an adjustment disorder. Worse yet, it was on July 19 2008, after going to see The Dark Knight, that I developed the worst case of the norovirus I have ever had in my life. For several days I simply could not keep anything down. That Sunday, July 20 2008, I then stayed in bed. Even if I had not been predisposed to do so, I had little choice but to remain in bed and watch the Mad Men marathon on AMC that day. For those of you who don't remember, the second season of Mad Men debuted on debuted on July 27 2008. To promote the new season, AMC then showed every episode from the first season on July 20, starting at 11:00 AM Central. Now I had seen a few episodes from later in the show's first season, enough that it intrigued me. Even if I had not been sick, I probably would have watched the whole marathon. Regardless, by the end of marathon I was hooked on Mad Men. I became a fan of the show and it remains the only show from the 21st Century to rank in my top ten favourite shows of all time. Of course, anyone who knows me would understand why Mad Men would fascinate me. Ever since my teens, I have been fascinated by the Golden Age of Advertising. Even before Mad Men, David Ogilvy and Leo Burnett numbered among my heroes. What is more, the Sixties have always been my favourite decade for popular culture. A number of my favourite TV shows, movies, music artists, and fashions all emerged from that decade. While the Sixties is my favourite decade for popular culture, it was by no means perfect. In fact, for many it would have been a miserable decade in which to live. Racism was even more prevalent than it is now. Sexism was even more prevalent than it is now. About half of all Americans smoked and drinking to excess was not unknown among businessmen such as the ad men who worked at Sterling Cooper. As the decade progressed the United States would become more and more embroiled in the Vietnam War. 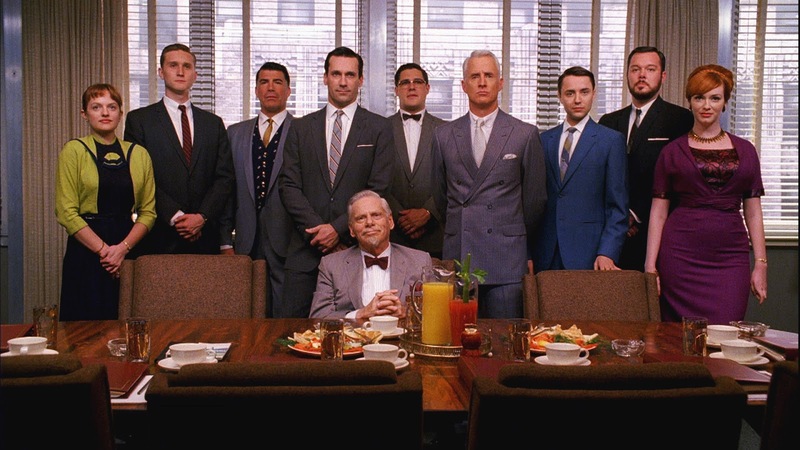 Fortunately, Mad Men acknowledged all of these things to some degree or another. The show definitely did not offer a romanticised, sanitised view of the Sixties. In keeping with a show that presented a realistic view of the Sixties, Mad Men featured realistic characters as well. There were very few characters who were purely good and bad. Perhaps no better example could be found than Don Draper (played by Jon Hamm), who was in many ways not a very nice guy. He was a serial adulterer who drank a bit too much and had something of a temper, which he sometimes displayed in front of clients. His wife at the start of the show, Betty (played by January Jones), was not any better. She could be downright abusive to her children, had a bit of a temper, and seemed to put more importance on a woman's looks than anything else. Even other characters who might seem purely bad (such as Pete Campbell, played by Vincent Kartheiser), occasionally displayed good qualities. What is more, Mad Men was very well acted and very well written. There should be no surprise that Mad Men won several Emmy Awards and was nominated for many more. 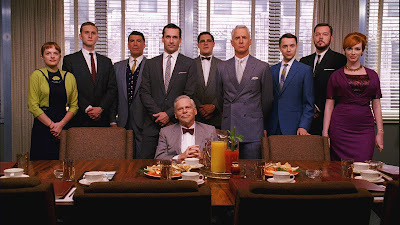 Ultimately, watching the Mad Men marathon on July 20 2008 and then watching the second season made my life a little bit more bearable during what was one of the worst periods of my life. The marathon would also introduce me to a show that I have watched faithfully ever since and one that would become one of my favourite shows of all time. To this day if I am feeling unhappy or stressed out, I can always guarantee on an episode of Mad Men to bring me out of it. Steve Ditko, the legendary comic book artist and writer who created the Silver Age Blue Beetle, The Question, and Shade the Changing Man, who co-created Captain Atom with writer Joe Gill, and who co-created Doctor Strange and Spider-Man with Stan Lee, died on June 29 2018 at the age of 90. The cause was a myocardial infarction. Steve Ditko was born on November 2 1927 in Johnstown, Pennsylvania. He took an interest in comic strips while still young. particularly Prince Valiant by Hal Foster, the comic book character Batman, and Will Eisner's newspaper insert The Spirit. Mr. Ditko graduated from high school in 1945 and then joined the United States Army. While in the military he drew cartoons for a military newspaper. In 1950 he enrolled in the Cartoonist and Illustrator School (now the School of Visual Arts) in New York City. It was in 1953 that Steve Ditko's first professional work was published in Daring Love no. 1 (October 1953), a romance title published by the imprint Gillmor Magazines of the minor publisher Key Publications. He worked for three months in the studio of comic book legends Joe Simon and Jack Kirby. Afterwards he worked with another comic book legend, Mort Meskin, from whom he learned a good deal. It was not long before Steve Ditko's first work for the company with which he was most closely associated would be published. 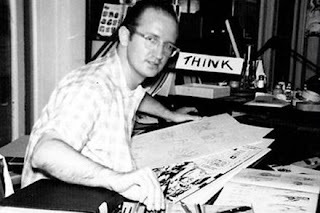 While Mr. Ditko would work for many other companies, throughout his career he would return to Charlton time and time again until the company folded in 1986. His first work for the company was published in the horror comic book The Thing! no. 12 (February 1954). Unfortunately, Steve Ditko would contract tuberculosis and had to take a break from the comic book industry in order to recuperate. It was after Steve Ditko returned to comic books that he did his first work for the company that would become known as Marvel Comics. He worked on the company's giant monster and sci-fi titles, including Journey into Mystery, World of Fantasy, Tales of Suspense, Tales to Astonish, and Amazing Adventures. It was during this period that Steve Ditko co-created the superhero Captain Atom with Joe Gill at Charlton. The character first appeared in Space Adventures no. 33 (March 1966). Mr. Ditko would later make important contributions to two Marvel superheroes. Stan Lee had created Spider-Man after publisher Martin Goodman had requested that he create an ordinary, teenage superhero. Initially Mr. Lee approached Jack Kirby, with whom he had created The Fantastic Four, to illustrate the new character. While Mr. Kirby's work was good, however, Mr. Lee did not think it fit the character. He then turned to Steve Ditko. It was Mr. Ditko who gave Spider-Man his web-shooters and designed his costume. Steve Ditko would illustrate the character's debut in Amazing Fantasy no. 15 (August 1962) and the first issues for The Amazing Spider-Man from 1963 to 1966. While Stan Lee was the original impetus for the creation of Spider-Man, it was Steve Ditko who came up with the initial idea for Doctor Strange. In addition to coming up with the initial idea for Doctor Strange, Mr. Ditko also illustrated the feature and co-plotted his adventures. Eventually he plotted the Doctor Strange feature on his own. He continued to work on Doctor Strange until 1966. Steve Ditko left Marvel in 1966 for reasons that are not entirely clear. He had already done some work for Charlton in 1965, returning to the character he had co-created, Captain Atom. In 1967 Mr. Ditko created the Silver Age Blue Beetle. While Fox Feature Syndicate had published a character of that name during the Golden Age and Charlton had published a revamp of the character in 1964, Steve Ditko's Blue Beetle was an entirely new creation that owed very little to the earlier character. During this period with Charlton, Mr. Ditko also created The Question. In addition to his work at Charlton during this time. he also illustrated stories, most of them written by Archie Goodwin, for Warren Publishing's magazines Creepy and Eerie. It was also during this period that Steve Ditko created Mr. A, who first appeared in Wally Wood's underground comic book witzend. Mr. A expressed Steve Ditko's ideas on Objectivism. In 1968 Steve Ditko moved to DC Comics. There he created The Creeper, who first appeared in Showcase #73 (Mar-April 1968) and then in six issues of Beware The Creeper. He also created the characters of Hawk and Dove, who also first appeared in Showcase before appearing in their own magazine. Afterwards Steve Ditko worked exclusively for Charlton Comics in addition to various independent publishers. He created and wrote the backup features Liberty Belle (not to be confused with the DC character of the same name) and Killjoy for Charlton's E-Man in the Seventies. It was in 1975 that Steve Ditko returned to DC Comics, where he crated Shade the Changing Man (who would later be revived under DC's Vertigo imprint without Mr. Ditko's involvement). He also co-created the short-lived sword and sorcery title Stalker, and he worked on the first two issues of Man-Bat. He created a new version of Starman with Paul Levitz, who appeared in Adventure Comics. Steve Ditko left DC for Marvel in 1979, where he took over Jack Kirby's title Machine Man. In the Eighties he would also work on Rom Spaceknight and Speedball. In the Eighties he also worked for various independent publishers, including Pacific Comics (for whom he created the characters Missing Man and The Mocker), Eclipse Comics (for whom he created the character Static--not to be confused with the later Milestone Comics character), and First Comics. He worked briefly on Archie Comics' revival of their superhero line in 1983 and 1984, illustrating stories featuring The Fly, Fly Girl, and The Jaguar. In the Nineties Steve Ditko did his last work for Marvel. He co-created Squirrel Girl with Will Murray and worked on the titles Phantom 2040 and Saban's Mighty Morphin Power Rangers, among others. In the Naughts He also did his last work for DC, illustrating a New Gods story. From the late Naughts onwards, Mr. Ditko's work was with Robin Synder, who had been an editor at Charlton. These included new Mr. A material. While Steve Ditko was an adherent of Ayn Rand's Objectivism, fortunately for me and many others not much of his Objectivist views found their way into his mainstream work (not counting Mr. A, of course). Regardless of Mr. Ditko's philosophical views, there can be no doubt that he was a very talented artist. His style was certainly unique. It was slightly cartoony, very surreal, and often filled with detail. The vistas he created for his Doctor Strange stories in the Sixties were moody and have been described as psychedelic. Mr. Ditko's style was fluid and often idiosyncratic. His work on Spider-Man and Doctor Strange offered a sharp contrast to the more traditional work being done by Jack Kirby at Marvel at the time. No artist drew quite like Steve Ditko. What is more, Steve Ditko would leave behind a legacy that only a few comic book artists and writers could match. He co-created two of Marvel's best known characters, Spider-Man and Doctor Strange. While they would not gain the fame of the Marvel characters, he also created some of Charlton's best known characters: Captain Atom, The Blue Beetle, and The Question. He would have a lasting influence on comic books that is still being felt to this day. Indeed, Steve Ditko's impact can be seen in everything from DC's animated shows and features to Marvel movies such as Guardians of the Galaxy and, naturally, Doctor Strange. Few comic book artists and writers ever had the impact that Steve Ditko did. On July 5 1974 CBS aired the animated feature film Yellow Submarine (1968) on The CBS Friday Night Movies. Even at eleven years old I was a huge Beatles fan, and so I was naturally looking forward to the movie. And even though it was the American version of the film (more on that later), Yellow Submarine did not disappoint me. Not only did it feature some of my favourite Beatles songs, but the animation was unlike anything I had ever seen. It was a far cry from the Warner Bros. theatrical cartoons and Disney animated features I had seen throughout my childhood. It became my favourite animated feature film of all time and it remains so to this day. It was fifty years ago today that Yellow Submarine premiered at the London Pavilion. As odd as it might sound, Yellow Submarine emerged from an American Saturday morning cartoon, namely The Beatles. It was in 1965 that King Features Syndicate obtained the rights to produce a cartoon based on The Beatles for American television. The Beatles proved to be a hit and aired on ABC from 1965 to 1969. Despite the cartoon's popularity with the younger set, The Beatles themselves were not initially pleased with it. John Lennon in particular complained that it made them look like "the bloody Flintstones." It was Al Brodax, the head of King Features' motion picture and television development at the time, who proposed making an animated feature film based on The Beatles' songs. He suggested to Brian Epstein, The Beatles' manager, that such a film could satisfy The Beatles' agreement with United Artists for a third film after A Hard Days Night and Help!. Having gotten the go-ahead to make the film, Mr. Brodax turned to TVC London to produce the movie itself. TVC London was founded in 1957 as TV Cartoons by animator George Dunning. Initially TVC London produced commercials for British television, although they eventually expanded into producing such animated shorts as "The Wardroble" and "The Apple". The success of TVC London led King Features Syndicate to contract TVC London to make the Saturday morning cartoon The Beatles in 1965. George Dunning himself would direct Yellow Submarine, while Jack Stokes of TVC served as the film's animation director. Al Broadax would have been happy with a feature film that simply expanded on The Beatles Saturday morning cartoon, but TVC London had something different in mind. The Beatles animated TV series utilised the extremely limited animation common to Saturday morning cartoons of the time. On the other hand, Yellow Submarine utilised what can best be described as stylised full animation. Yellow Submarine even departed from earlier animated feature films, particularly those produced by Disney. It was the first animated feature to draw upon the Pop Art of the day, psychedelia, Op Art, and many other modern artistic styles. It was also the first animated film with a rock soundtrack and the first animated feature with characters based upon real people (The Beatles). While Yellow Submarine turned out to be something very different from The Beatles TV series, it may have owed something to the Saturday morning cartoon. The episode "Strawberry Fields Forever", produced for the cartoon's third and final season, featured a plot superficially similar to Yellow Submarine. Quite simply, The Beatles used the song "Strawberry Fields Forever" to make a drab orphanage a happier and more colourful place for the children there. What is more, it included some psychedelic imagery. In the end the episode is more than a little reminiscent of the sequence in which The Beatles bring colour back to Pepperland through use of their songs. The original story for Yellow Submarine was written by Lee Minoff. The screenplay itself would ultimately be the product of multiple writers, including Jack Mendolsohn (who had worked for King Features on their "Krazy Kat" and "Beetle Bailey" television shorts, as well as The Beatles cartoon) and Eric Segal (who later wrote the novel Love Story, upon which the 1970 movie was based). Reportedly, the screenplay for Yellow Submarine went through 14 drafts. The plot for the movie that ultimately involved The Beatles being recruited by Old Fred (voiced by Lance Percival) to save Pepperland ("an unearthly paradise 80,000 leagues under the sea...") from the Blue Meanies, who hate anything happy and hate music more than anything else. The Blue Meanies not only rob Pepperland of any of its colour, but all of its music as well. Given how The Beatles viewed the Saturday morning cartoon, it should come as no surprise that initially they were not enthusiastic about Yellow Submarine. Even if their busy schedules had permitted them to do so, The Beatles probably would not have provided their own voices for the film. It was actors John Clive who voiced John, Geoff Hughes who voiced Paul, Peter Batten who voiced George, and Paul Angelis who voiced Ringo. It was only after The Beatles saw the rushes for Yellow Submarine and saw that it was very different from the Saturday morning cartoon that they developed any enthusiasm for the project. Ultimately, they agreed to the live-action cameo that appears at the end of the film. While George Dunning directed Yellow Submarine and Jack Stokes served as the film's animation director, the film's art director came from outside TVC London. For the art director on Yellow Submarine TVC London hired German illustrator Heinz Edelmann. At the time Mr. Edelmann was known for his work on theatrical posters and the youth magazine twen, using a psychedelic style similar to contemporary Milton Glaser (here it must be noted that artist Peter Max did not work on Yellow Submarine and in fact Mr. Edelmann was working in psychedelia before Mr. Max was). Originally Heinz Edelmann was only supposed to work eight weeks during which he would design the look of the movie. In the end Edelmann worked an entire year on Yellow Submarine, often sleeping only four hours a night to complete the project. He was in charge of over 200 artists. In the end, Yellow Submarine would take a toll on Edelmann's health. It took him two years to recover from working on the film. Of course, at the core of Yellow Submarine are the songs of The Beatles. The film utilised eleven full-length Beatles songs, as well as shorter snatches of yet other songs. The vast majority of the full-length songs had been previously released, the oldest being "Nowhere Man" from the album Rubber Soul. The Beatles provided Yellow Submarine with four, never-before-released songs. "Only a Northern Song" was written by George Harrison and recorded during the sessions for Sgt. Pepper's Lonely Hearts Club Band. "All Together Now" was written by Paul McCartney during the sessions for Magical Mystery Tour. "It's All Too Much" was written by George Harrison and had been considered for inclusion in the TV special Magical Mystery Tour. "Hey Bulldog" was written by John Lennon, and was the one song written specifically for the movie Yellow Submarine. When Yellow Submarine was released in the United States on November 13 1968, it was a slightly shorter film than had been released in the UK and Europe. Al Brodax felt that the film ran too long and as a result the "Hey Bulldog" sequence was cut from the American release, as was a sequence in which The Beatles met their Pepperland doppelgängers Sgt. Pepper's Lonely Hearts Club Band. Fortunately the original British release was restored for its 1999 release on DVD, so that Americans have been able to see the same movie that the British and Europeans had seen since the Sixties. Sadly, Yellow Submarine did not initially do well at the British box office. In fact, according to an August 14 1968 article in Variety, the film had been dropped by several Rank Organisation theatres because of poor box office sales. Fortunately, it performed much better in the United States, where it became a box office hit. On both sides of the Pond Yellow Submarine received generally positive reviews, and has since come to be regarded as a classic. Time magazine included it in their list of "The 25 All-Time Best Animated Films". The film boasts an impressive a 96% percent rating on the web site Rotten Tomatoes. Yellow Submarine would be briefly released on VHS and Laserdisc in the Eighties. As mentioned earlier, the British release would be restored and released on DVD. More recently, Yellow Submarine has been restored again and released on DVD and Blu-Ray for its fiftieth anniversary. It has also been re-released to theatres throughout the United States and Europe. Ultimately, Yellow Submarine would prove to be a pioneering effort in animated films. It was the first animated feature film with a rock soundtrack, as well as one of the earliest animated films to break with the Disney's more naturalistic style of animation. A January 9 1974 article in Variety gave credit to Yellow Submarine for bringing about a "graphic revolution". In many respects Yellow Submarine was revolutionary. It was the first animated film to utilise a diverse array of styles, from Pop Art to psychedelia to Op Art and yet other styles. 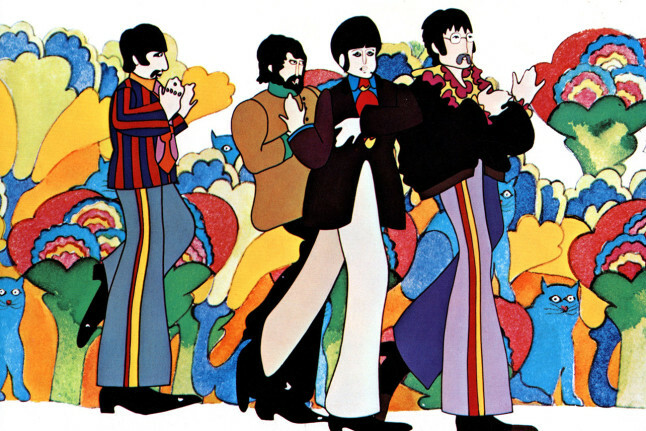 Yellow Submarine also used a number of different animation techniques, from the time honoured technique of rotoscoping to the incorporation of live action photographs. It was a far cry from the animated features of Disney or even the Fleischer Brothers. Today, fifty years after its premiere, Yellow Submarine is considered a classic. It is often counted among the greatest animated films of all time. It revolutionised animation and paved the way for animated features that departed from the Disney model and that appealed to teens and adults as much as (if not more than) they do to children. In the end, animation would never be the same again.